Last year, after a lot of rum and a good boogie in Viaduct, I accidentally agreed to a trip to Hong Kong. 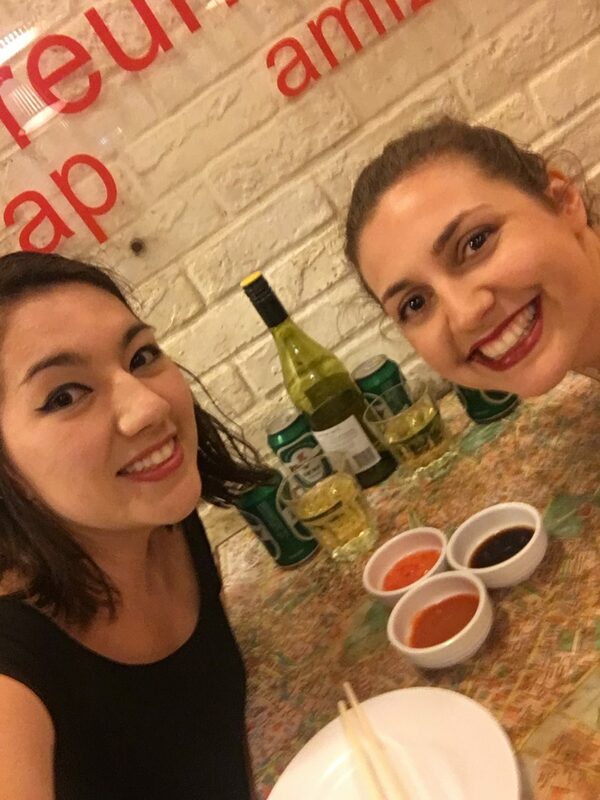 My lovely friend Aliss would be flying out to China on a business trip and asked me if I fancied meeting her in Hong Kong for a few days when she’d finished working. Of course the influence of alcohol resulted in an instant “yes” from me. 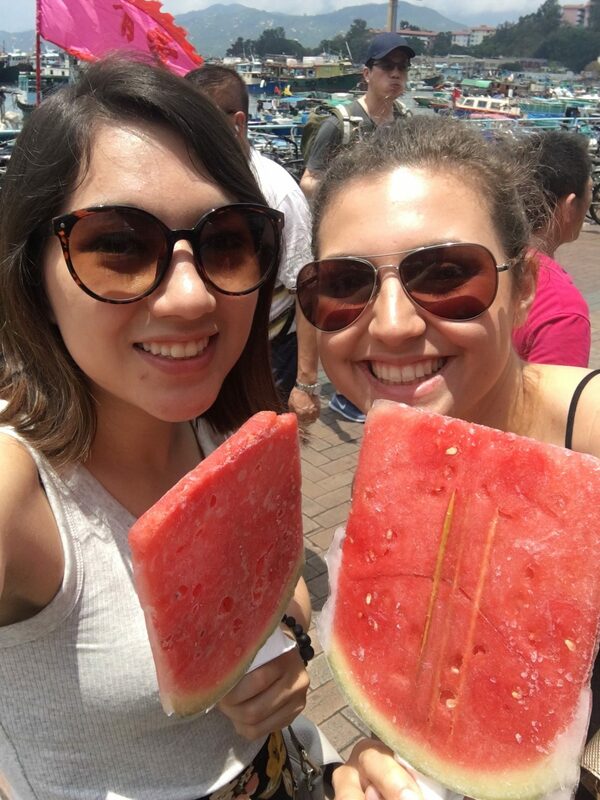 I had completely forgotten about the conversation until Aliss text me a few of days later and, although Hong Kong had never really been on my bucket list, I had no reason to decline so decided “why the hell not?!”. 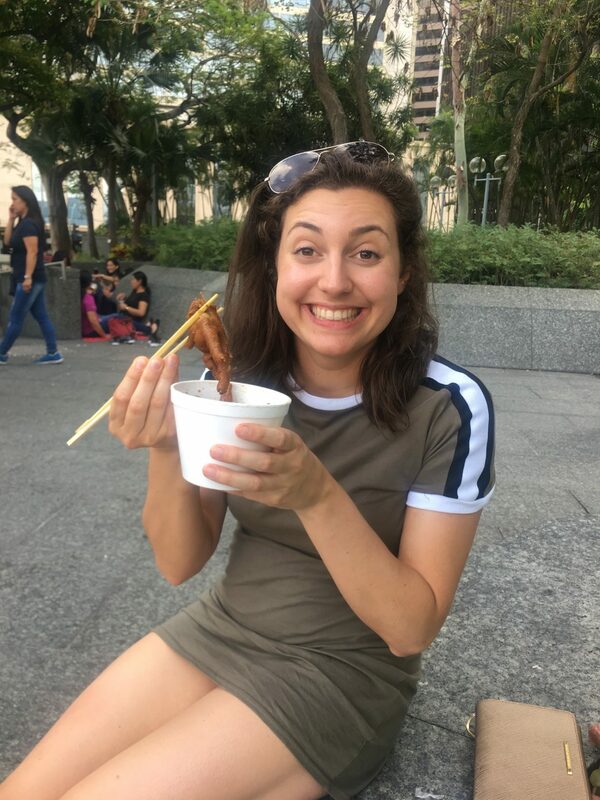 After a few months of saving, I booked my flights with Cathay Pacific and started researching the most important part of any adventure: the food! I quickly realised that Hong Kong was going to be a foodie’s dream and spent the next few weeks thinking about little other dim sum. 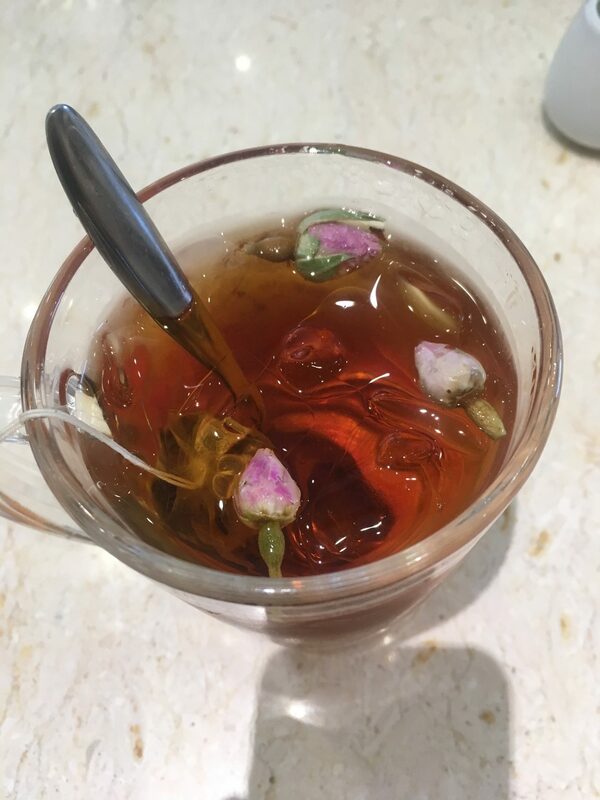 I’m not going to claim to be an expert on what to eat in Hong Kong and where to eat it, but hopefully this post will serve as inspiration to visit this incredible fusion of East and West and give you some ideas of where to eat if you do so. 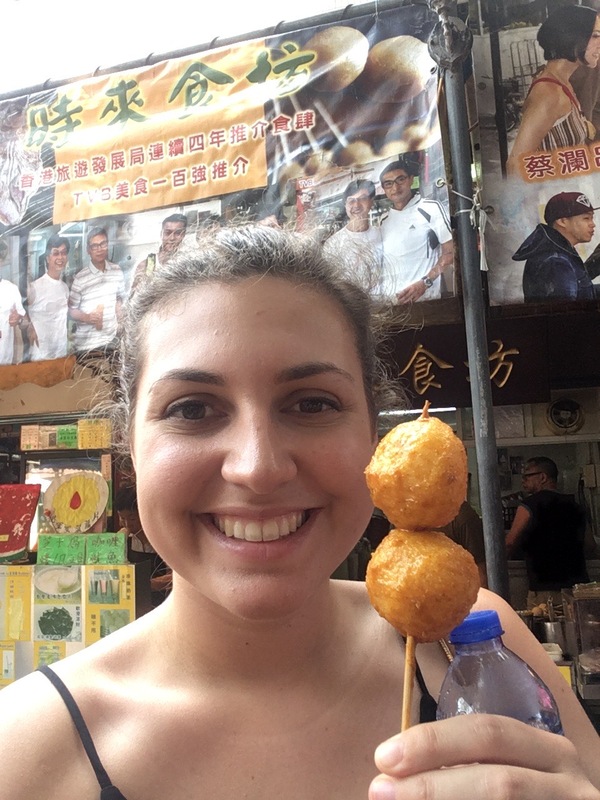 So, here are my Hong Kong foodie highlights. Let’s start with the first meal of the day. I arrived in Hong Kong at 8am, so as soon as I’d dropped my luggage at the hotel and met Aliss, we went for breakfast. 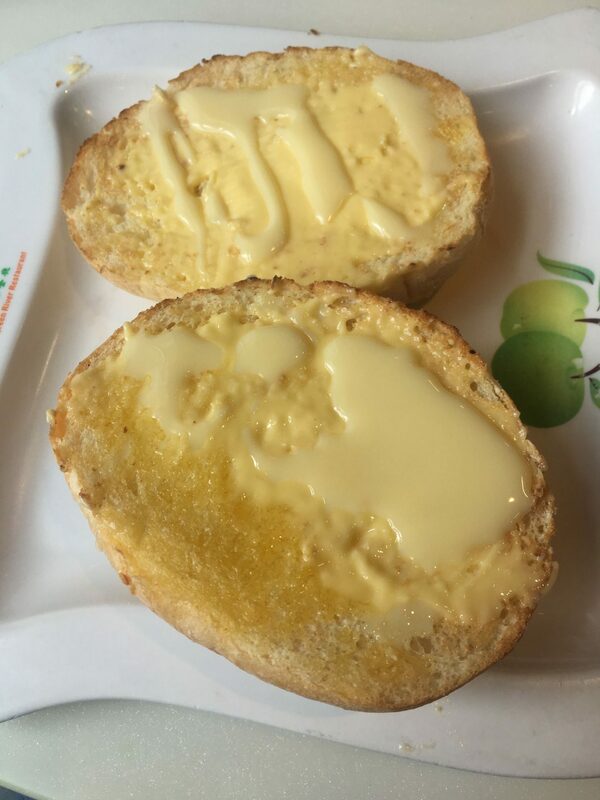 This is when my world was turned upside down by toast topped with CONDENSED MILK!! Why had I never tried this before? Highly recommend, and of course very easy to make at home. 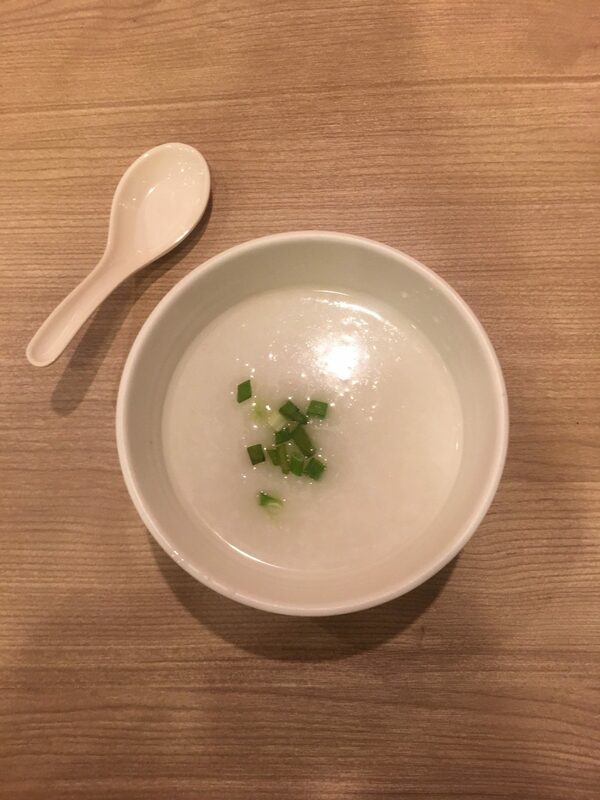 One thing that I was really excited to try for breakfast was congee, a rice porridge commonly eaten in China as the first meal of the day. This was actually the only thing I tried on the whole trip that I really didn’t like! I found it plain tasting and I wasn’t a fan of the texture at all. However, you should definitely give it a go if you want to eat like a local, and Aliss liked it so can’t have been all bad! I was nowhere near as daring as I thought I would be when it came to street food. Aliss is a vegetarian which meant that I didn’t have a fellow meat eater to spur me on and dare me to try the likes of snake soup and duck tongues. 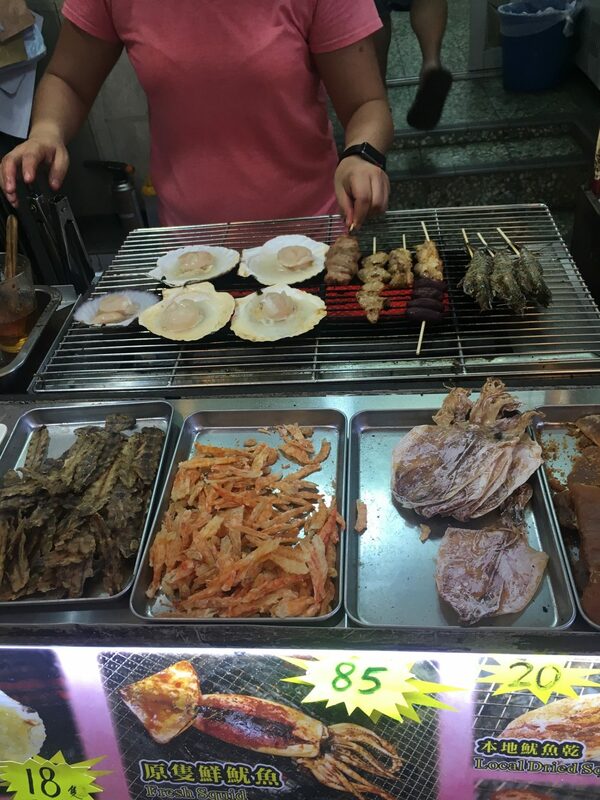 However, the street food that I did try was amazing! My top three dishes weren’t in the city but on outlying islands, and I would definitely suggest making the trips to the these places. Giant fish balls. This is fish made into a ball shape, not specific fish body parts (does that even exist on a fish?). I tried this on a visit to Cheung Chau, a small but stunning island which was one of mine & Aliss’ favourite places in Hong Kong. There were plenty of stands selling fish ball as the island is famous for them, and they came with a variety of sauces drizzled over the top. I enjoyed these so much that I had them twice! 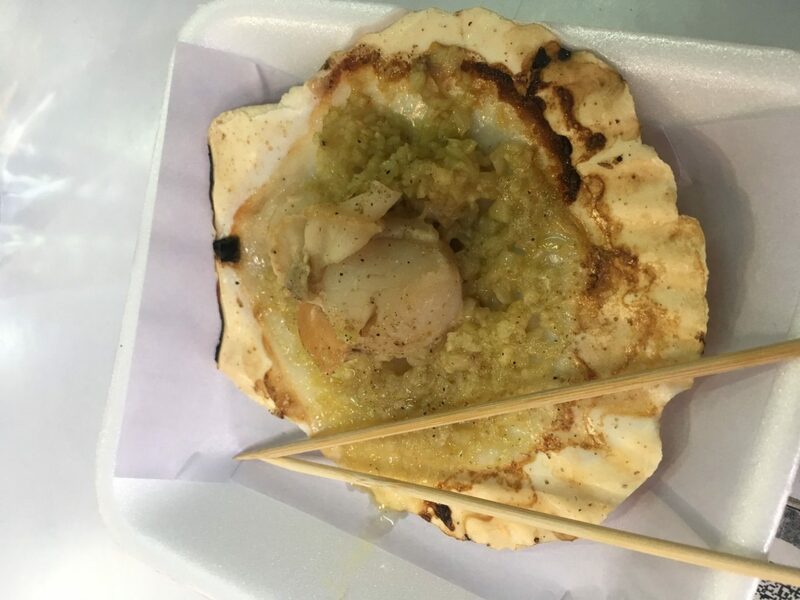 Scallop with (a lot of) garlic. I tried this on an afternoon trip to Tai O, a quiet fishing village where the houses were on stilts and pink dolphins frequent the shores (we didn’t see any, despite paying an extortionate £3 for a boat trip). Being a fishing village, most of the street food consisted of fish which was beautifully fresh and oh so delicious. 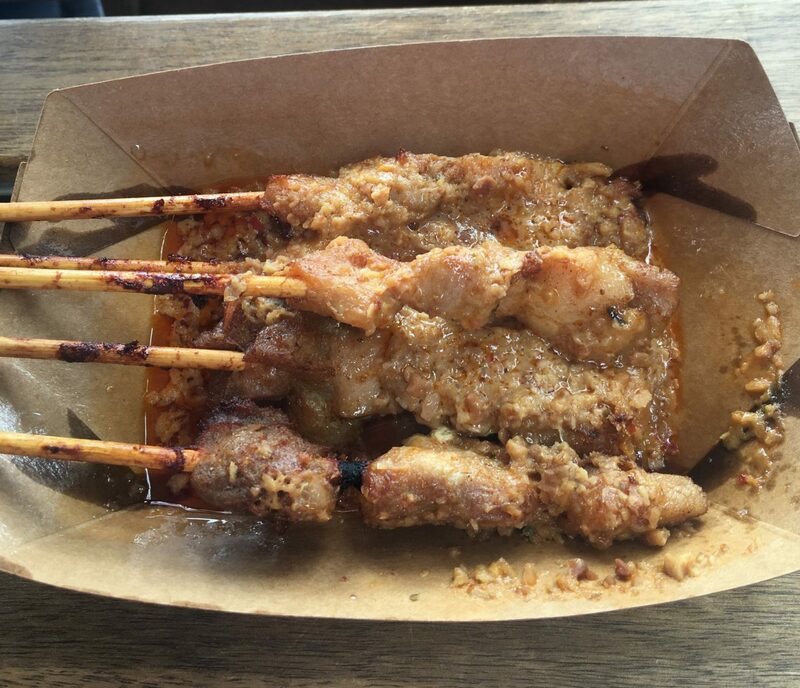 Satay chicken skewers. This is my favourite dish from the Chinese at home, so of course I had to try it on the first day of my trip. I ate this on Stanley Island along the seafront and really wasn’t feeling my best after an 11 hour flight. The punchy flavour sorted me right out, and although it tasted completely different to the satay at home (in a good way) it was still comforting to have a familiar dish so far away. 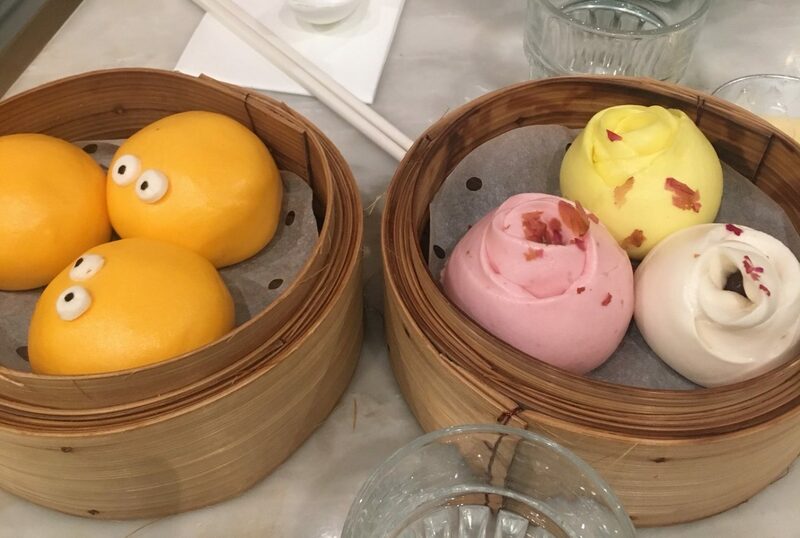 A lot of dim sum was eaten in 6 days, but there was a clear winner. So good that not only did we go back to the same restaurant twice, but I ordered exactly the same thing on my second visit. With the thousands of restaurants to try in Hong Kong, I really didn’t think that would happen! 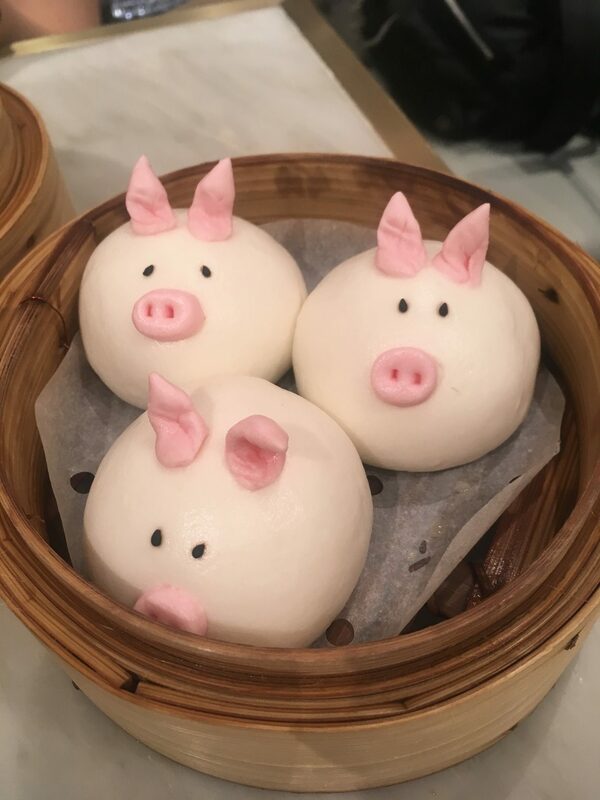 For more traditional dim sum, I would highly recommend Tim Ho Wan. This is apparently the cheapest Michelin star restaurant in the world, and it certainly lived up to expectations. I believe there are a few of these around the city, but the one we went to was in a train station and almost impossible to find… it took us a good half an hour and we asked at least three people for directions. I ended up eating a lot of food here, as the menu wasn’t very clear on what was vegetarian and what contained meat so I ended up eating most of Aliss’ order. I really enjoyed everything from here so can’t really make a recommendation, but if you’re looking to try chicken feet I would say this is the place to do it! Hong Kong is known for it’s views, with countless sky bars and restaurants. 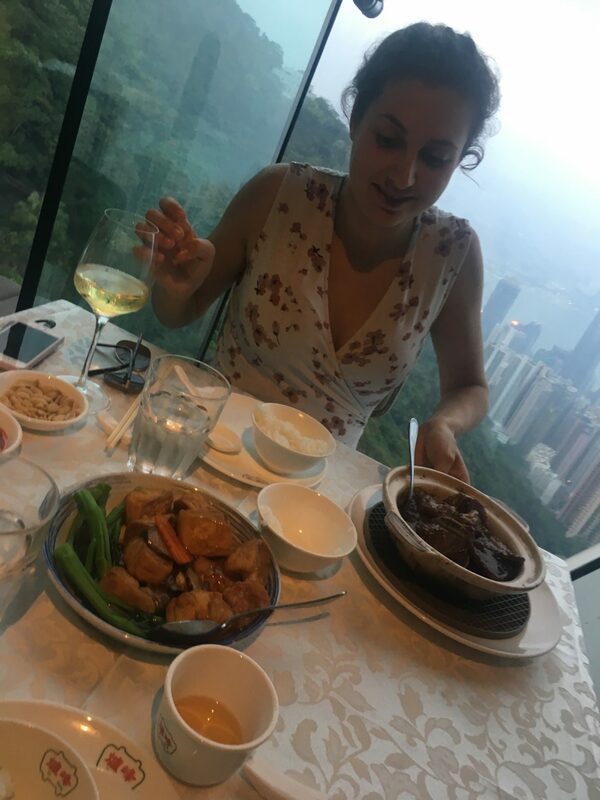 Our first evening was spent at the top of Victoria Peak and, as this is a bit of a tourist trap, I didn’t have high hopes for the food. I was proven wrong! We ate at Lú Fēng at a window table with breathtaking views, and I ordered beef short rib in a black pepper sauce. It wasn’t as good value as the other places we ate at in Hong Kong, but it wasn’t extortionate and the food tasted great. Mr Wong gets his own sub-heading here. A work colleague recommended this place to me and, as it was a five minute walk from our hotel (if you can call it that), we thought we’d give it a try. The food wasn’t what made this our ultimate highlight – it tasted good but no different to a Chinese takeaway you’d get at home. What made this place was Mr Wong himself. Mr Wong was an eccentric man with an infectious (scary?!) laugh… think Mr Woo from Benidorm if you’ve ever watched that. 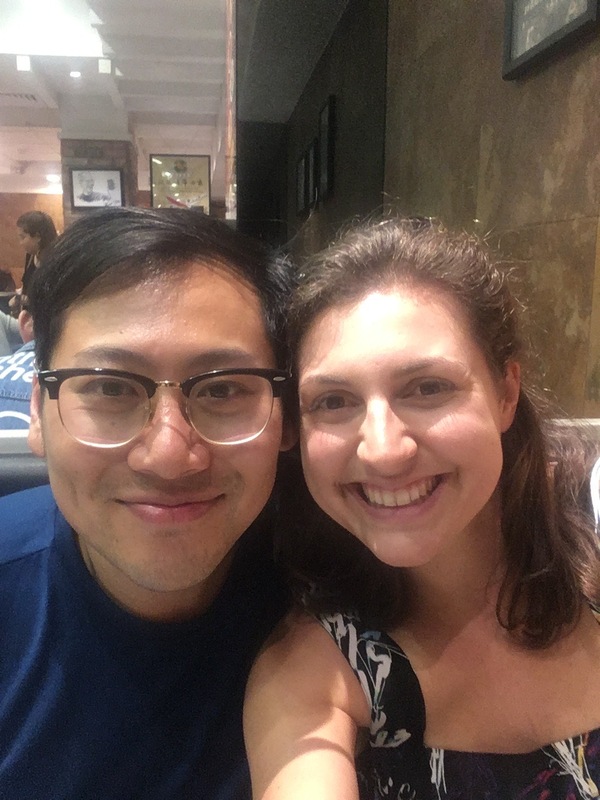 We sat down at a table, and Mr Wong greeted us by slamming an unopened bottle of Absolute Vodka onto the table, laughing hysterically, running off, and returning with a bottle of wine and several cans of beer which he also slammed onto the table. Mr Wong didn’t give us a menu and instead brought out a selection of dishes, telling Aliss that both the chicken and the beef were tofu whilst laughing hysterically. While we ate, he drank a bottle of whiskey and told us about his passion for Donald Trump, why building a wall between Mexico and America was a fantastic idea, and telling us the Brexit was the best idea ever. We walked out of Mr Wong’s full and drunk, for the price of approximately £8 each. There were so many more food highlights such as enjoying roast goose with a local who befriended me (until I had to pretend to be a lesbian to get rid of him), cooling down on a hot day with frozen watermelon on a stick, eating chocolate covered frozen bananas and custard tarts and drinking pretty teas. 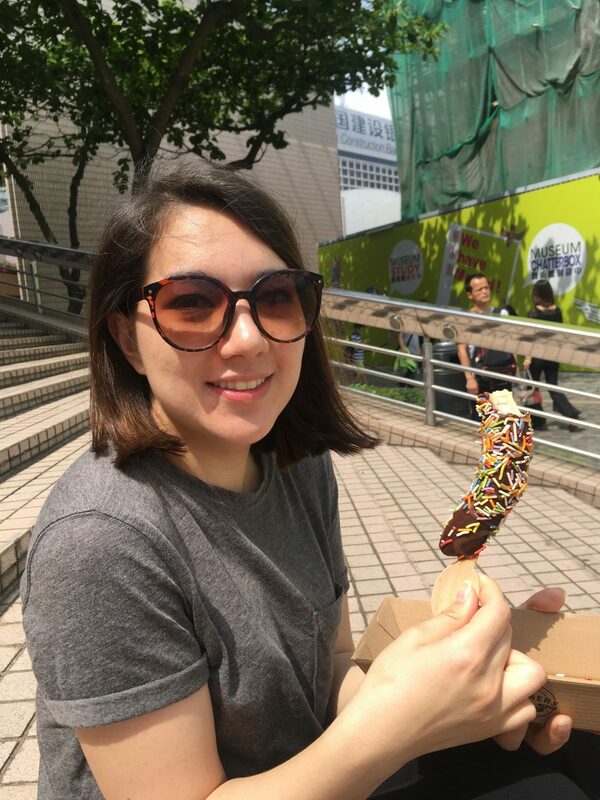 If you’ve been to Hong Kong I’d love to know what you ate and which restaurants were your favourite so please comment below. Likewise if you’re thinking about going to Hong Kong and want some more specific recommendations get in touch and I’ll try to help!